Hi friends! Happy Monday! I hope that you all are doing well! Today will be Brady's first day of preschool so I'll let you know how it goes. Hopefully, it will go well and that I will be able to get some good pictures to show you as well. Keep your fingers and toes crossed. I'm guessing that there will mostly be crying pictures. Ok, it's the first Monday of the month and that means that we have a new Lawnscaping Challenge for you all! 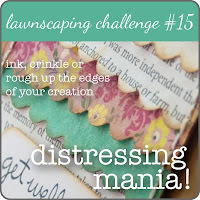 This challenge is Distressing Mania! You can use ink, crinkling, or sanding the edges on your creation. This was kind of a hard one for me but I worked it out so you can too! We have a fabulous sponsor this week! Simon Says Stamp is returning as our sponsor. I love this store, they have so much fabulous stuff including Lawn Fawn Stamps! They are offering up a $25 gift certificate. Here's my card for this week. 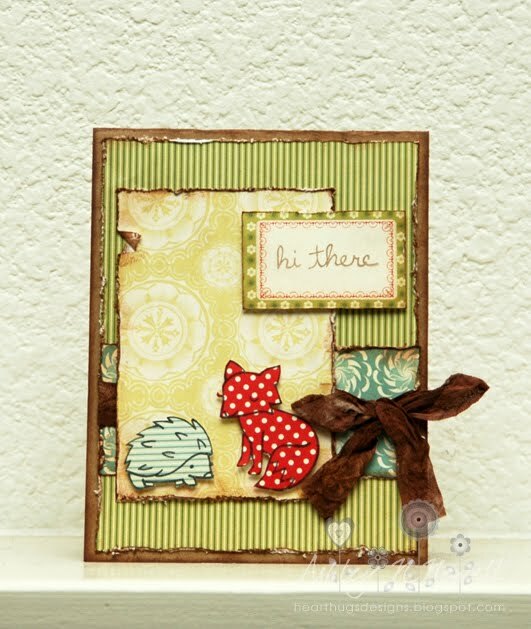 I used Lawn Fawn's Critters in the Forest and Sophie's Sentiments for this. The paper is Cosmo Cricket's Odds and Ends. Oh Distress love! I like the paper pieced critters and all the patterns. It reminds me of an old quilt in a way. Lovely and loved. Your card is amazing, Ashley! You took distressing to a whole 'nother level! Love it. I agree with Chari, it reminds me of an old, beloved quilt. Gorgeous. Hope Brady has a great first day! Awesome distressing and paper-piercing! It was nice to meet you too! Can't wait to hear how your son's pre-school day went! Oh Ashley, this is so cute. Love the paper pieced animals.